It’s that time of year again: the time of year when the slow death of nature brings on the vibrancy of autumn as well as the odd driving habits of flatlanders to the state of Vermont. Generally, starting in late September and rolling over into the middle of October, Vermont’s deciduous (leaf bearing) tree population begins to go through its annual harvest transformation. Vermont’s fall foliage has been, and will continue to be, one of the state’s largest seasonal tourist attractions, as long as the leaves keep changing. There are several factors that cause Vermont’s hills and valleys to transform into the wondrous, breathtaking Rastafarian greens, oranges, yellows, and reds that we see each fall. It all starts with the budding of leaves. With a wet spring, leaves will bud on time and at their normal rate. If there happens to be a non-traditional dry spring, the leaf and tree attachment processes may happen at a quicker rate. Then, in the fall, these leaves will ultimately detach from the tree and fall too soon, usually before they have undergone color transformation. Moving through the summer months and into early fall, minimal rain with sunny days and cool nights will help put the photosynthesis process in the leaves to rest. This will result in the yellow (xanthophyll) and orange (carotenoids) pigments in the leaves to start showing their color. Photosynthesis is simply the process that feeds the green (chlorophyll) pigments within leaves. Green is dominant throughout a leaf’s life because during the summer leaves are constantly fed sunlight, thus making the photosynthesis process continual with longer days and shorter nights. Now, moving into early autumn with an ideal spring and summer, it is simply time to take in all of the beauty that Mother Nature has produced. For leaves to reach their full color potential before falling off the tree, it is best to have little rain and minimal winds. 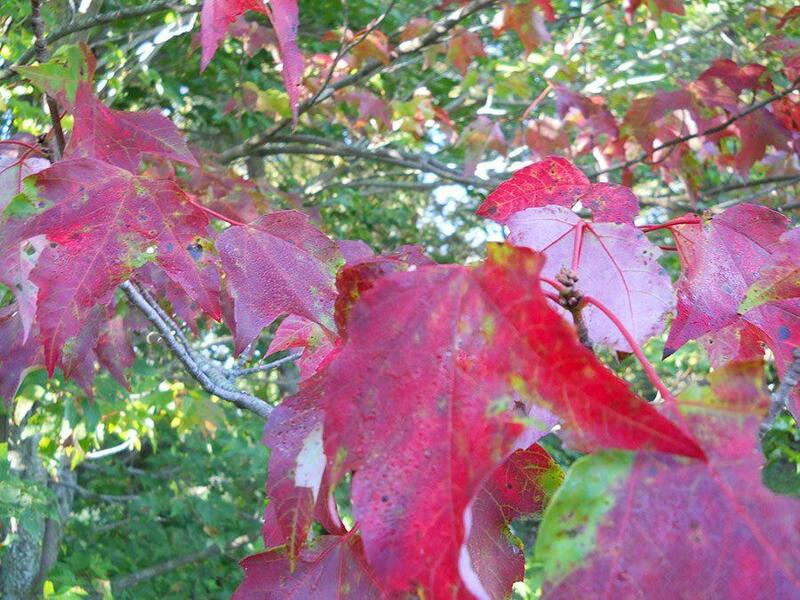 You will generally begin to see the first signs of leaf color changes in Vermont’s highest elevations. The cooler temperatures of the mountains will begin to slow the photosynthesis process rapidly, resulting in color change first. You will begin to see color changes during the following weeks in the lower elevations. Similarly to the way that the highest elevations usually change in leaf color first, you will also notice that the leaves near the top of a tree change first. They are furthest away from the tree’s roots, thus receiving the least amount of nutrients. These leaves’ green pigments then begin to give way to the oranges and yellows. Once again paralleling with the way higher elevation trees change color first, the northern areas of Vermont are also usually the first to change color. Vermont’s Northeast Kingdom is one of the most geographically significant areas in New England. When the colors of fall hit this particular area, it is simply more icing on top of a cake that was already beautiful to begin with. So once the leaves hit peak foliage throughout the state of Vermont, go out for a hike, mountain bike ride or drive on some back roads. You will hopefully witness some of Vermont’s best and breathtaking fall colors; just make sure you keep an eye out for those crazy drivers. It’s that time of year again: the time of year when the slow death of nature brings on the vibrancy of autumn as well as the odd driving habits of flatlanders to the state of Vermont. Generally, starting in late September and rolling over into the middle of October, Vermont’s deciduous (leaf bearing) tree population begins to go through its annual harvest transformation. Vermont’s fall foliage has been, and will continue to be, one of the state’s largest seasonal tourist attractions, as long as the leaves keep changing. There are several factors that cause Vermont’s hills and valleys to transform into the wondrous, breathtaking Rastafarian greens, oranges, yellows, and reds that we see each fall. It all starts with the budding of leaves. With a wet spring, leaves will bud on time and at their normal rate. If there happens to be a non-traditional dry spring, the leaf and tree attachment processes may happen at a quicker rate. Then, in the fall, these leaves will ultimately detach from the tree and fall too soon, usually before they have undergone color transformation. Moving through the summer months and into early fall, minimal rain with sunny days and cool nights will help put the photosynthesis process in the leaves to rest. This will result in the yellow (xanthophyll) and orange (carotenoids) pigments in the leaves to start showing their color. Photosynthesis is simply the process that feeds the green (chlorophyll) pigments within leaves. Green is dominant throughout a leaf’s life because during the summer leaves are constantly fed sunlight, thus making the photosynthesis process continual with longer days and shorter nights. Now, moving into early autumn with an ideal spring and summer, it is simply time to take in all of the beauty that Mother Nature has produced. For leaves to reach their full color potential before falling off the tree, it is best to have little rain and minimal winds. You will generally begin to see the first signs of leaf color changes in Vermont’s highest elevations. The cooler temperatures of the mountains will begin to slow the photosynthesis process rapidly, resulting in color change first. You will begin to see color changes during the following weeks in the lower elevations. Similarly to the way that the highest elevations usually change in leaf color first, you will also notice that the leaves near the top of a tree change first. They are furthest away from the tree’s roots, thus receiving the least amount of nutrients. These leaves’ green pigments then begin to give way to the oranges and yellows. Once again paralleling with the way higher elevation trees change color first, the northern areas of Vermont are also usually the first to change color. Vermont’s Northeast Kingdom is one of the most geographically significant areas in New England. When the colors of fall hit this particular area, it is simply more icing on top of a cake that was already beautiful to begin with. So once the leaves hit peak foliage throughout the state of Vermont, go out for a hike, mountain bike ride or drive on some back roads. You will hopefully witness some of Vermont’s best and breathtaking fall colors; just make sure you keep an eye out for those crazy drivers.